Time for a bit of blog candy! Bit behind again so no cards/projects till Wed so I thought I'd offer some blog candy in the meantime just to keep you going. Katharina always kindly puts some stamps in our WoJ DT packets for us to give away as candy and I've not offered mine yet. If you would like to enter my candy draw then just leave your name under this post . (spread the news if you wish but not a requirement) That's it! I'll randomly pick winner next Monday 6th April (please check back for winner. If prize isn't collected within 2 days I will re-draw, only fair I think). Open to all and will post internationally. 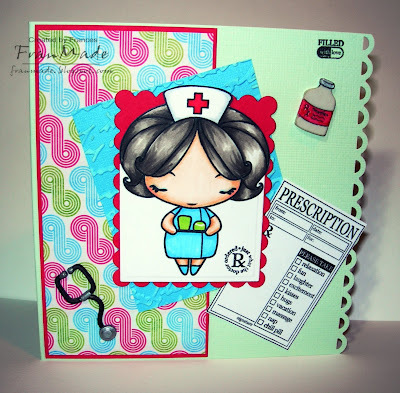 Fab sketch over on PTW and I wanted to use another of my Anya stamps and this fab 'prescription' stamp I found at Silly Monkeys when I got her a while ago, which I thought went with her perfectly. Love that you can tick and write your own prescription on it :) - not done that bit yet until I come to use it. Again my photo skills are pants as I tend to take them late at night under my daylight bulb so am never sure how they will turn out once I've fixed/edited it - in this instance the pink cardstock looks red but it is pink and matches the dp IRL. This is another shot of at at different angle just so you can see the border on the right a bit better. DP: DCWV spring stack '08 plus some cardstock to match. blue piece has been embossed with cuttlebug script folder then sanded. 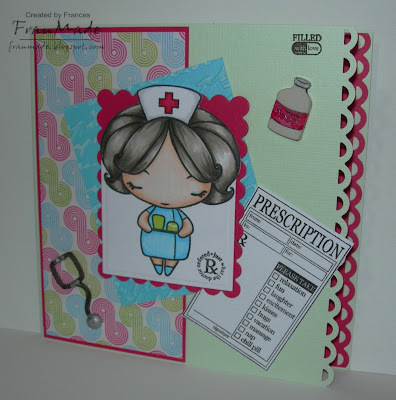 Others: Scallop rectangle nesties, Fiskars 'apron lace' border punch, stethescope & medicine bottle are decorative buttons which I have coloured with copics to match. May not be around till Monday evening now as I've got stuff to do not to mention a few DT things too (always run out of time why is that?!). So if I don't catch you till then have a lovely Sunday. 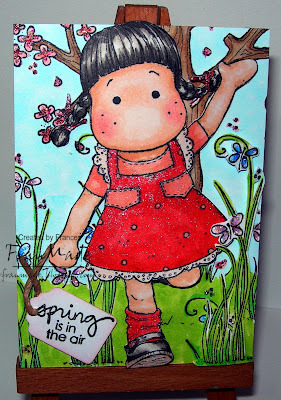 Here's the first of the 2 new stamps from Toodles & Binks . Another really simple card (seem to be in that phase at the moment) but I hope you like it. Been dying to use some more of my Ketto stamps from Stamping bella and these 2 looked like they could be sisters and fitted the layout I had in mind. 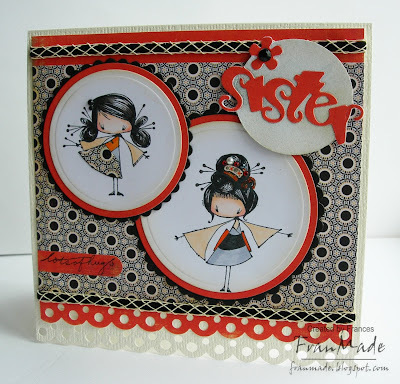 Others: petite scallop circle nesties, 'sisters' sizzix die, MS border punch. black ribbon trim and various adhesive gems - 1 in centre of flower and lots of mini ones in their hair! Haven't had a chance to visit a lot of blogs yet this week, will try to do that today. 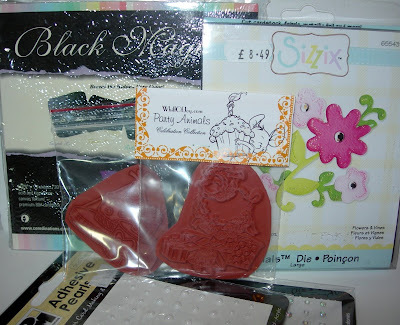 Also got my little DT packet off Toodles & Binks yesterday but had to go work so am itching to go use them today too as they are really cute (you can see them over on Toodles & Binks blog). Again photos aren't capturing the 3d sparkly nature of this as Tilda is raised and then the little bit of grass is raised even more in front of her. The photo below shows the 3 bits to my ATC before I stuck it all together; the main ATC background scene consisting of the spring tree and grass stamped 3 times, tilda cut out by herself and then another bit of the grass by itself. All coloured with Copics with stickles in the flowers and tilda's dress has coat of twinkling H2O. All then layered together with silicone glue so that it looks like tilda is running amongst the grass. I then just added a little mini tag with 'spring is in the air' to finish. Hope you like it, I sure enjoyed making it. 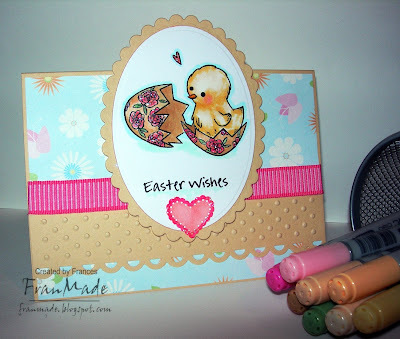 Please pop on over to the challenge blog to see what the rest of the DT have come up with and hope you'll join in with us and create something springy! Sketch Sat: Simply Matthew . 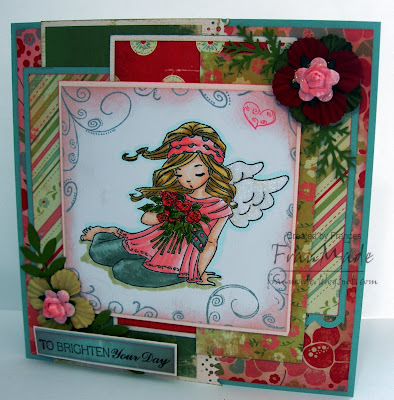 .
. . . and a few swirl stamps plus sentiment on this card I made for the 'Sketch Sat' sketch. Didn't want it any fussier as I thought the square dp layout with 'Matthew' in the middle was quite striking as it was. The image is raised on foam pads so is more dimensional IRL and his wings and flower are sparkly too. Why does it never look it in the pictures?! No need for a stash/description list as it's so simple, just the usual suspects; Copics, distress inks and the dp is BG ('Granola'). 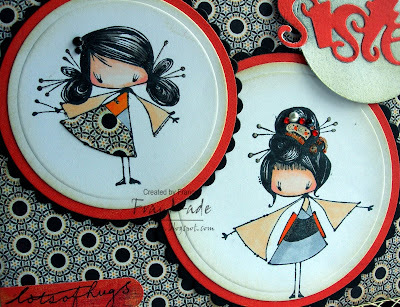 Cute Matthew stamp & the sentiment is of course from WoJ and the swirl ones are Inkadinkado. Oops was supposed to post this as my Monday post but forgot ! It's for the 'Truly scrumptious' challenge which was a lovely sketch so I thought I'd try to use up some scraps and this cute Charlotte image I had coloured up sitting on my desk. Colours aren't actually that bright in real life - it should be more lilac/pinks but looks blue/reds in photo and looks like the ribbon doesn't match but it does - honest!! Another great sketch over on Fri sketchers just never enough time to take part every week but I managed to this week, as it fitted perfectly with what I wanted to do with 'Musing Melinda' and the stack of presents from WoJ. The new releases are available NOW so I hope you managed to get the ones you wanted as I'm sure they're going to fly off the shelves. 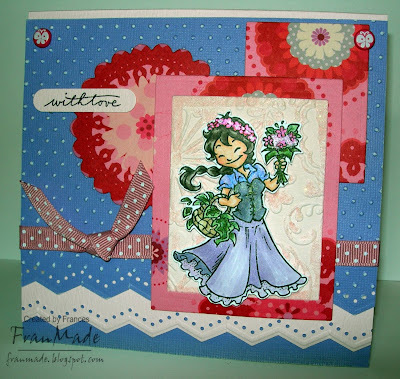 Images: 'Musing Melinda', 'swirly clouds' and 'present tower' all WoJ stamps. I've stamped Melinda then masked her before stamping the cloud for her to sit on :). Left the mask on and sponged distress ink all over background as the white didn't fit in with the rest of the distressed colours of the card. 'Happy Birthday' is from a HOTP stamp/paper kit I got off QVC couple years ago. Colouring: Copics then lots of twinkling H2O in her wings, hair, clothes and cloud. Distress ink sponged around edges of all the papers. Papers: Cosmo Cricket 'little girls'. Others: Fiskars 'apron lace' border punch, EK swirl flourish punch, decorative scissors used on edges of the sentiment (the off cuts have been stuck onto top/bottom of the strip running behind Melinda). Paper flower and gems to finish. Both the stack of presents and the central image are raised off the card with foam pads. Thanks for dropping by and for all you UK mothers out there, hope you've been pampered and treated today on Mother's day - funny how it's a different date for different countries don't you think?!! Have a good evening, what's left of it. Just 2 quick cards today and much more simple! (Which I love as much as, but find harder to do then cards with lots of layers and embellies). 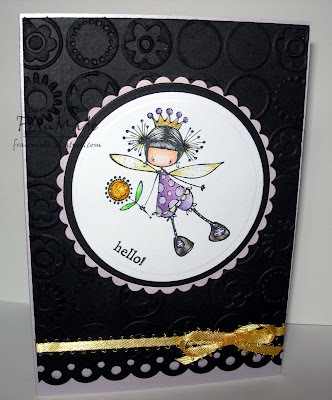 This first one is using a gorgeous new Ketto range from Stamping Bella which I just fell in love with on first sight and was one of my back orders I was waiting for (so no slapped wrists for spending again, . . well, not on this anyway, heehee). Meet Maisy Ketto. They are quite small so perfect for quick little cards (this is C6 card) and for keeping it simple which was the tricky bit for me. 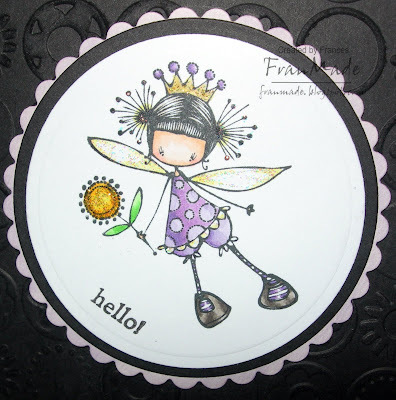 However, I managed to control myself and just did a bit of cuttlebug embossing on the back piece, used my circle nesties and my MS border punch then just splash of yellow with my ribbon to pick up on the yellow in the flower. The 'hello' is another stamp from my stash. Even though it's a small stamp it was great fun colouring her in with my copics and adding stickles to her so she was all glittery like a fairy should be! 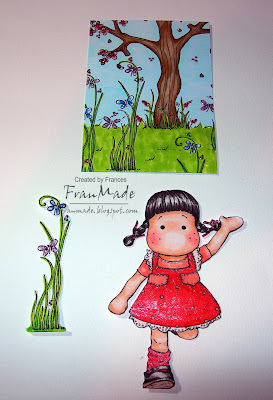 Ooo I just love those bloomers & big shoes :D I didn't make this to any challenge in mind but I think I'll enter it into the ABC challenge as it's 'F for flowers' this week and she's holding one and the embossed background has plenty too! My second card, I'm not so happy with but will share anyway. Would have thrown it away but it was a quickie and I think it's usable for when I need to send a quick note. 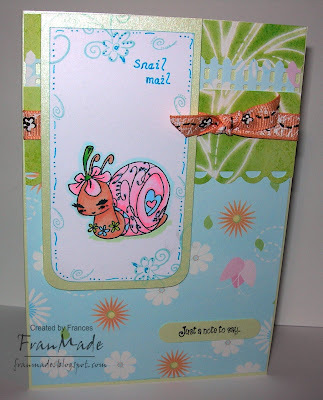 I've used the cute snail and some of the swirls from WoJ and the fab sketch over on Mojo Mon (which I've made look not very fab at all !). But where I went wrong was trying to just use up some scraps on my table and finishing it quickly late at night which shows I think! So that's my lot for today, good and not so good. Have a lovely Saturday, even if the sun's gone in hiding again like it has here. Hello again, here's my entry into colour create which this week is red & green and also managed the optional extra of 'wings'. I've used another of the upcoming WoJ release (on 22nd - only 3 more sleeps now or 2 if you're up late enough Sat to catch the start of it). It was another sunny day today so had trouble getting the lighting right. The first photo is a touch too yellow but is nice and bright and the 2nd photo is too grey but it shows the green inside edge on the right which highlights the scallop border when it's laid flat. so the true colour of the card is somewhere between these two photos! Still didn't manage to catch the glittery sheen in her dress or the 'angel' gems though! 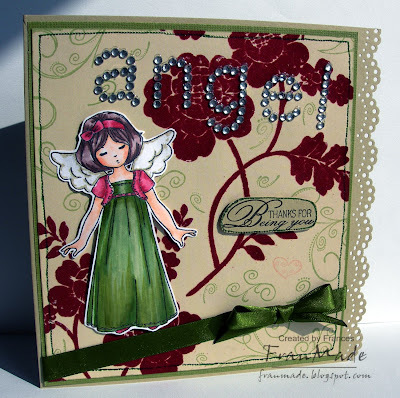 This little angel is just perfect for confirmations and christening cards as some of my DT teamies have shown but I think she's pretty as a normal, run of the mill angel too! Her little bob haircut is just too cute. That's all for today. Enjoy the rest of your day. Images: Angel, all the swirls in the background dp and the sentiment from WoJ, released this Sun. 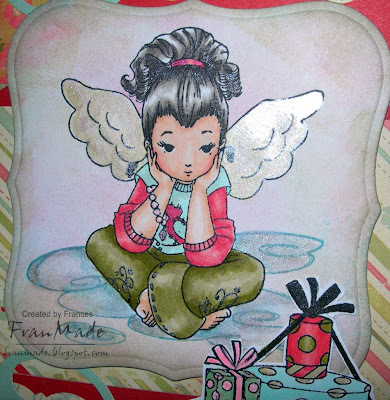 I've cut out angel and the sentiment and stuck on with foam pads for added dimension. DP: Just the one sheet from a Laura Ashley paper pack. Not sure of name but it has some wonderful flocked designs in there and this is 1 of them. I've just stamped swirls all around the velvet flocked roses then added faux stitching around the edges with a green stardust pen. 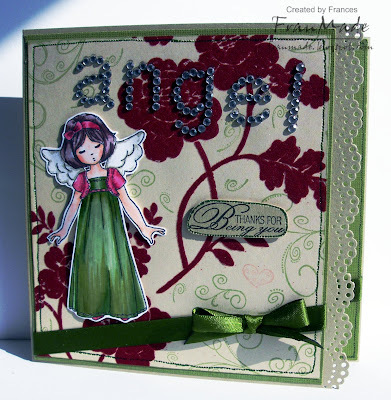 Others: MS doily lace punch for the border, 'angel' gem word and satin ribbon to finish. Well, the challenge over on CCT this week is a recipe (something torn, 2 papers and only 4 embellishments). Now, we were told to follow it closely and so being the good girl that I am I tried! 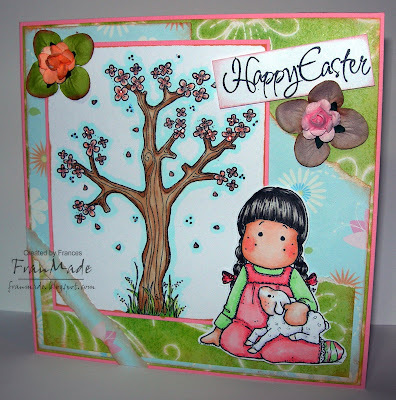 Images: spring tree, tilda & happy easter all from the Magnolia easter collection. Got these from Tab (prior to my stash diet! ), here - fab service! Don't forget to go check out the rest of the gorgeous DT examples and there's also a fabby 'Greeting Farm' candy this week (Chef Ian set) which I want! 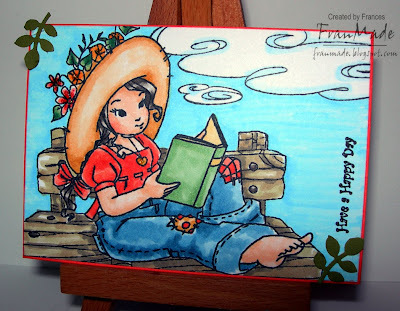 As the title suggests, ATC challenge this week is to make ATC in landscape format. Using my WoJ got me in 'Elisabeth Bell' mode (who by the way, has some amazing blog candy on at the moment if you missed the WoJ spring kit) so I dug up this uninked cutie (shame on me!) from 'Sweet Art Ebony' range at Sugar Nellie and teamed her with some of the new, to be released, WOJ accessories to make a little landscape scene, hope you like it . .
Really simple; just stamped and masked the girl ('a good book' from Funky Kits), then stamped the bench (new release from WoJ on 22nd) and then added the cloud (another new release on 22nd from WoJ) in the corner before colouring it all in with Copics. Added sentiment and 2 little punched leaves before matting onto coloured card to frame it all (just used white card and coloured edges in with Copic for perfect match). Think that's why I love making ATCs - great excuse for me to just colour in without having to worry too much about matching colours to dp etc. Don't forget to pop on over to see the rest of the DT examples and maybe join in too - you may just like it! Gorgeous sunny day today - off to enjoy a bit of it (supposed to be cold again by Fri!) before work tonight. Have a good one & see you tomorrow for my CCT and possibly another WoJ preview too. Here's another WoJ preview and I thought I'd go for a more simple, clean style this time. It also happens to fit 3 challenges; PTW (food), Secret Crafter ('have your cake & eat it') and Spoonful of Sugar (gems)! I think this may be my favourite out of the new release - she's just so sweet AND she's got food in her hands LOL. 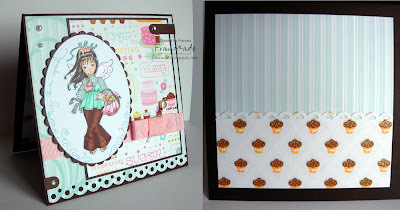 Couldn't decide which photo/angle to use so here's a shot from another angle and also the inside of the card - really simple, in keeping with the front but I just had to show you the dp - don't you just love those glittered cupcakes?! 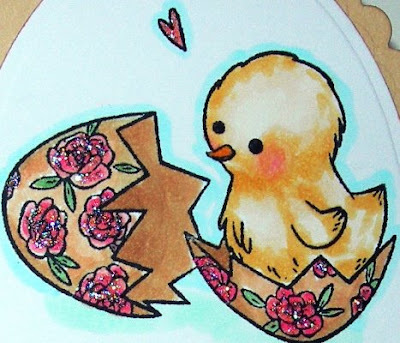 Colouring: Copics and lots of stickles. Particularly love the stickles on the cupcakes as it's a distress stickles in antique linen so it's matt, not sparkly and I think it makes it look like a crunchy sugar coating! 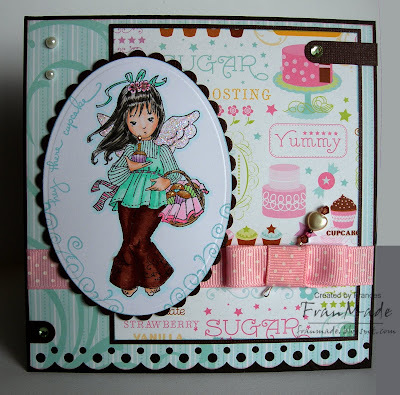 Papers: DCWV 'Sweet' stack - perfect for all my food/cake type stamps. Others: Petite Scallop nesties, MS border punch (now available from various UK stockists), SU word window punch, gems, ribbon and heart pin made by me from a jewellery head pin with various beads added to it. O.K as promised, here is the first of lots of gorgeous new WoJ previews this week in anticipation of the new release this Sun 22nd March. 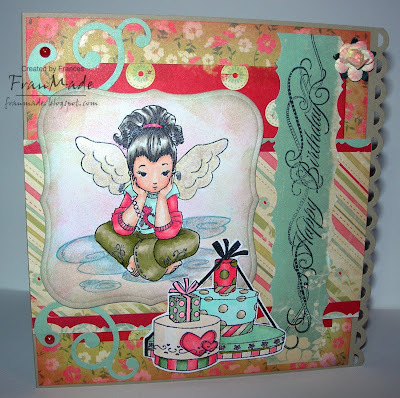 As well as lots of gorgeous guardian angels there are a few little accessories and some fabulous swirl stamps (designed by our very own WoJ DT Sonja) and some great sentiments (courtesy of Bev) so it was a tough choice as to which ones to use first! 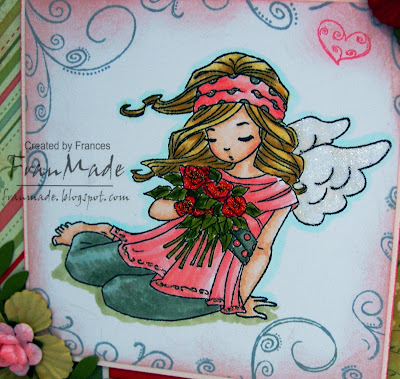 In the end this cutie won (love that bunch of roses and her cute drapey top too) and I had to use this week's WoJ challenge sketch as well (although I had to move the sentiment - hope that's o.k!). 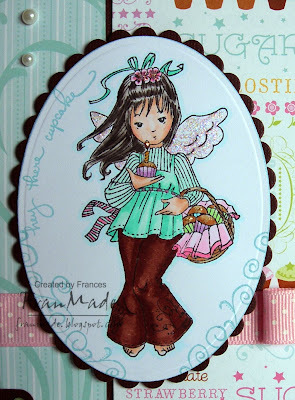 Images: gorgeous Melinda angel (not sure of her proper title yet), all the fab little swirls and heart doodles and the sentiment are all stamps from the forthcoming WoJ release on the 22nd. 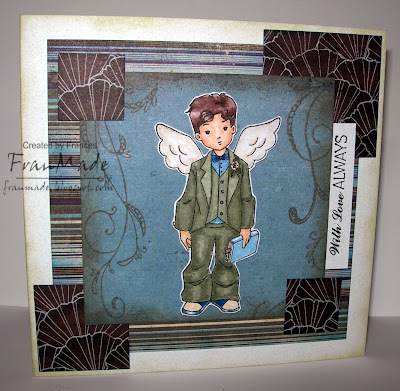 Colouring: melinda stamped and coloured with Memento ink & Copics. Distress inks for the swirls and for all the edges. Stickles on the roses, bits of her clothes and her wings. Hope it's 'brightened your day' although you may not need it if the weather is as sunny and spring like as it is here (still not very warm though!). Don't forget to check out the rest of the WoJ DT for more sneek peeks throughout this week. CCT wine & dine - the whole hog!